Owner-occupancy has been the historical norm in Luxembourg. However, the real estate market soar has made accessing property a lot harder in certain municipalities or neighbourhoods in the capital. Let’s discover the hit-parade of the most expensive areas to live in. Based on its GDP per capita and purchasing power, Luxembourg was designated the second richest country in the world by the Global Finance magazine last February. With a 4.4% average increase since 2010, real estate prices reflect this wealth by continuously hitting new records. However, huge gaps between different municipalities or even between Luxembourg city’s neighbourhoods are hidden behind these averages. Let’s have a closer look on the topic. Bertrange stands out as the most expensive municipality in the country. Growing strongly, the average price per square meter has increased by 57% since 2010, well above the national average (+32%). Well served by the road and railway network, the municipality takes advantage of its proximity to the capital. Its appeal is strengthened by its abundant offer in commercial and educational infrastructure, including the European School of Luxembourg II. Contrary to common belief, Luxembourg city doesn’t dominate the ranking. 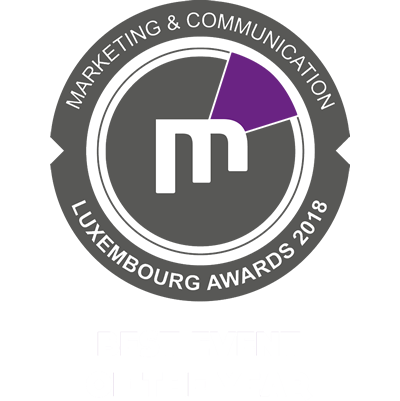 With a 46% increase in its prices since 2010, the municipality of Luxembourg only comes in second place. An observation that should be put in perspective as a very strong disparity exists between neighbourhoods. An existing apartment will be advertised on average at 5,506€/m² in Hamm, whereas Limpertsberg will display 11,346€/m², representing a gap of 106%! At 6,338€/m², with a healthy 41% increase since 2010, Strassen closes the top 3 of the most expensive municipalities. 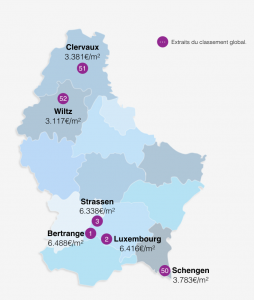 At half the price compared to the top of the ranking, the least expensive municipalities in 2016 are Wiltz, Clervaux and Schengen. A gap that has been widening, since their increase since 2010 has been well bellow the national average, respectively 7.5% for Wiltz, 1.7% for Clervaux and a little less than 20% for Schengen. What about the off-plan market? For a new apartment, a premium of 500 to 1,500€ per square meter needs to be added. Here, the top 3 of the most expensive municipalities is slightly different. Strassen, third in the ranking for existing apartments, earns the title of the most expensive municipality for off-plan property. The average cost per square meter will be 7,592€, representing a 1,254€/m2 premium compared to an existing apartment. In comparison, the difference is only 854€ in the municipality of Luxembourg city. The appeal for a neighbourhood is mostly defined by its geographical location and its offer in infrastructure. Limperstberg takes advantage of its ideal location, between Ville-Haute and Kirchberg, with many local schools, the Vauban French School (which will move to Gasperich in September 2017) and a university campus. The prices of the neighbourhood are also driven by its mix of high-demand mansions and modern luxury constructions. Second in terms of average advertised price, the demand for Kirchberg is continuously growing. Many multinational companies (audit firms, law firms, banks…) and European institutions (European Court of Auditors, European Parliament, European Investment Bank) are located in this high employment neighbourhood. There is a high demand for real estate in the area, especially from high purchasing power buyers looking to live close to their workplace. With an average advertised price of 8,399€/m2, Belair arrives in third place of the most expensive neighbourhoods, thanks to its easy access to Ville-Haute and its great living conditions. What makes a municipality expensive or not? The proximity to the capital seems like the main factor that impacts local real estate prices. In 2009, the difference between an apartment in Luxembourg city compared to the country’s average was 14%. Today, the gap has widened to 24%. The increasing problems related to traffic is the main reason that reinforced the trend of living close to your workplace. Recently ranked third most congested country in the European Union by INRIX, this trend will likely worsen as the country is going through a strong demographic growth (+12% since 2010) and where 46% of the active population are cross-border workers. Quality of life is also an important factor that impacts property prices. The easy access to nurseries or schools, the presence of shops and retail businesses and the offer in municipal infrastructure have an important role in a buyer’s final decision. Should you want to evaluate your home or a property? The online tool my|VALUATION takes in account the latest registered transactions in the municipality, as well as the positive and negative factors that impact the value of a home, to give a precise valuation of a property. Check the latest release of the BIL IMMO index, for more information on the Luxembourgish real estate market. 2. What about the off-plan market? 4. What makes a municipality expensive or not?